Aref Al-Amri says good-bye to everything and everyone he loves in his hometown of Muscat, Oman, as his family prepares to move to Ann Arbor, Michigan. This is Naomi Shihab Nye s first novel set in the Middle East since her acclaimed Habibi.Aref Al-Amri does not want to leave Oman. He does not want to leave his elementary school, his friends, or his beloved grandfather, Siddi. He does not want to live in Ann Arbor, Michigan, where his parents will go to graduate school. His mother is desperate for him to pack his suitcase but he refuses. Finally, she calls Siddi for help. But rather than pack, Aref and Siddi go on a series of adventures. They visit the camp of a thousand stars deep in the desert, they sleep on Siddi s roof, they fish in the Gulf of Oman and dream about going to India, they travel to the nature reserve to watch the sea turtles. At each stop, Siddi finds a small stone that he later slips into Aref's suitcase mementos of home. 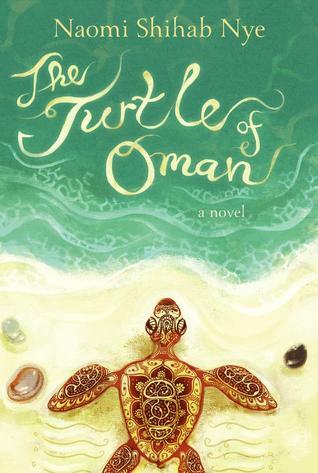 The Turtle of Oman is a lovely, gentle story. The main character Aref's quiet innocence puts me in mind of The Year of Billy Miller by Kevin Henkes. I have to say though, I was bummed that none of this story actually takes place in Michigan. When it said that Aref was moving to Ann Arbor, I was excited at the prospect of reading a story in one of my favorite towns, but this book is only about Aref's preparation to move, not about the move itself. Having said that, even though I was bummed that this story doesn't actually take place in Ann Arbor, I'm equally happy that it's a quiet, peaceful story that takes place in a Middle Eastern country. Too often we perceive the Middle East as one big conflict zone, but here you have a young protagonist who loves his home and doesn't want to leave it. So in that regard, this is a great book to give to young people to help change their perceptions and prejudices. I could see this book being a sleeper Newbery honor in February.